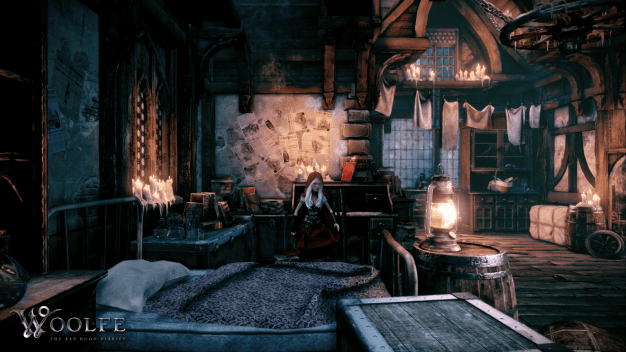 Red Riding Hood is out for blood and vengeance in Woolfe: The Red Hood Diaries. After training (with her granny) for four years in the art of combat and survival, 18-year-old Red Riding Hood is now deadly and focused on avenging her father’s wrongful death four years earlier. Her thirst for vengeance will only be quenched once the blood of B.B. Woolfe, CEO of Woolfe Industries, is dripping down her axe. Red Riding Hood’s apartment in Ulrica. Joseph R. Hood, Red’s father and lead engineer at Woolfe Industries, was found dead in his studio at Woolfe Industries. An investigation was starting to piece clues on the case together but Woolfe shut it down, saying that Joseph’s death was an unfortunate accident, case closed. Red and many others suspected foul play but no one could prove it…yet. The workers of Woolfe Industries went on strike and 14-year-old Red Riding Hood went to go live with her grandmother. It was her grandmother who taught Red everything she knows (except for swimming). Four years later, Red returned to the city of Ulrica to seek out the truth of what happened to her father and put the Woolfe down. In terms of story, Woolfe: The Red Hood Diaries‘ dark beginnings hooked me right away: a corrupted fairy tale universe filled with violence, hatred and an army of evil toy soldiers that put 3000 people out of work. Red will go to any length to dispatch B.B. Woolfe. B.B. Wolfe is one seriously corrupt business man with daddy issues. 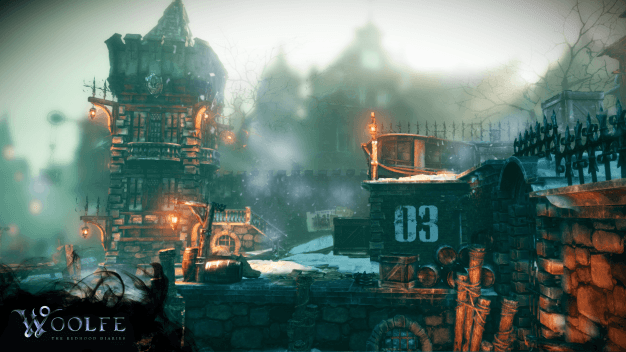 He inherited Woolfe Industries, Woolfe Mansion and even the whole town of Ulrica from his late Father, Anton Woolfe. Anton Woolfe was a man with a dream, a dream he realized with the creation of Woolfe Industries and the founding of Ulrica, a city he named after his wife, Ulra. The people of Ulrica and the employees of Woolfe Industries thought highly of Mr. Woolfe and took it very hard when he passed and B.B. took over. With B.B. in control of Woolfe Industries, employees became over worked, under-appreciated slaves to the company. In fact, Red’s father pretty much lived and (literally) died at the company. B.B. managed to cover it up the death and tried to persuade people to move on. It was an accident. Case closed. That’s when Red decided to start training and begin axeing some questions around Ulrica, in hopes of finding out what happened to her father and avenge him. 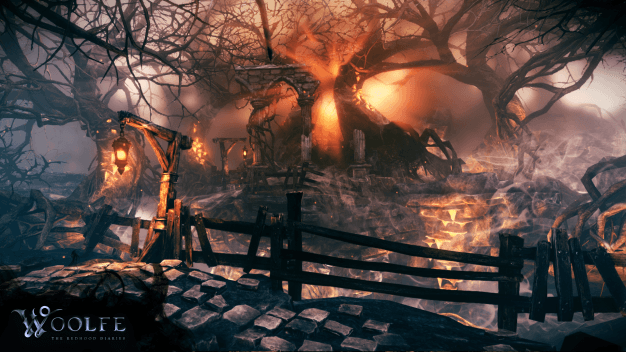 The combat system in Woolfe – The Red Hood Diaries is a hack-n-slash style platformer where players must continuously hack away at enemies and dodge any incoming counter attacks. There are a few attack techniques Red can use to initiate combat and gain the upper hand but those moves require a charge-up time and are generally hard to pull off during combat. The controls, while easy to learn, still felt clunky in combat. Often I would rage when the button or command I just tried to use would not input correctly, or if it did, would input much too slowly. The various puzzles and platforming challenges were fun but a tad too easy. The majority of them focused on timing. I did not have to think too hard about what I had to do. Just had to time when to jump or stop moving, etc. 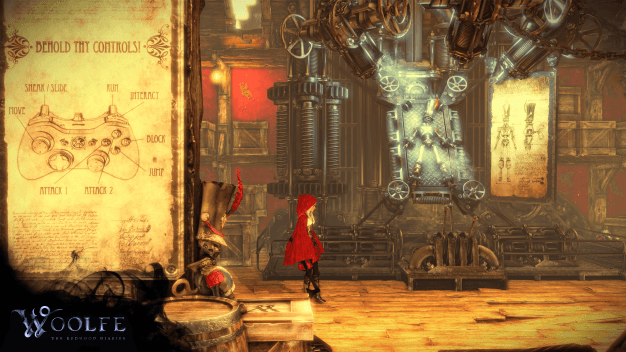 Visually, Woolfe – The Red Hood Diaries is beautifully made with a ton of diverse backgrounds for Red to explore. The voice over work is top-notch as well if not a little corny at times. 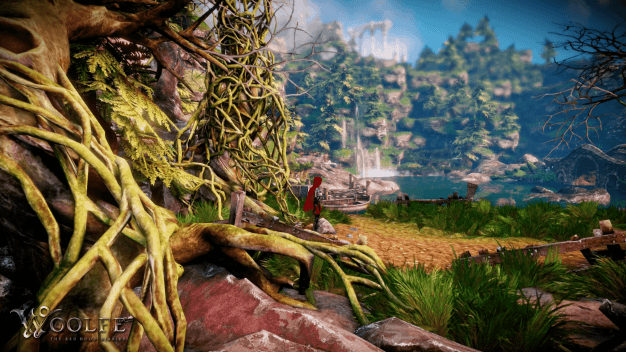 This gorgeous game is narrated by Red Riding Hood herself. She has a dark, smoky voice and rhymes most of what she says. The idea of making the narration rhyme was a genius idea. It truly suits the fairy tale aspect of the game. A complaint of mine is that sometimes the developers tried a little too hard to make something and the line, spoken very seriously, ends up sounding cheesy or lame. Another complaint is the length of the game. You can knock out this chapter of the game (yes, there will be a second part) in roughly three-to-four hours. I do not feel like that amount of gameplay justifies its $10 price tag but it is still a good game none-the-less. Narration aside, there is certainly nothing lame about Woolfe -The Red Hood Diaries. I had a lot of fun playing the game and was delighted to hear that this is only volume 1 of the series. Volume 2 is expected to arrive in August of 2015. If this game sounds good but you are not a PC gamer, never fear. You can expect to find Woolfe -The Red Hood Diaries out on both next-gen systems later this year. If you want to grab it now though, pick it up on steam today for only $9.99.